Mayor Fisk continues to wreak havoc in Murdock’s life in Daredevil #600 as the Man Without Fear rallies the heroes of New York City against the mayor’s schemes. Ever since Wilson Fisk, the Kingpin of crime, was elected as mayor of NYC he’s made superheroes illegal and appointed Matt as deputy mayor to ensure Murdock was too busy to interfere with his criminal dealings. 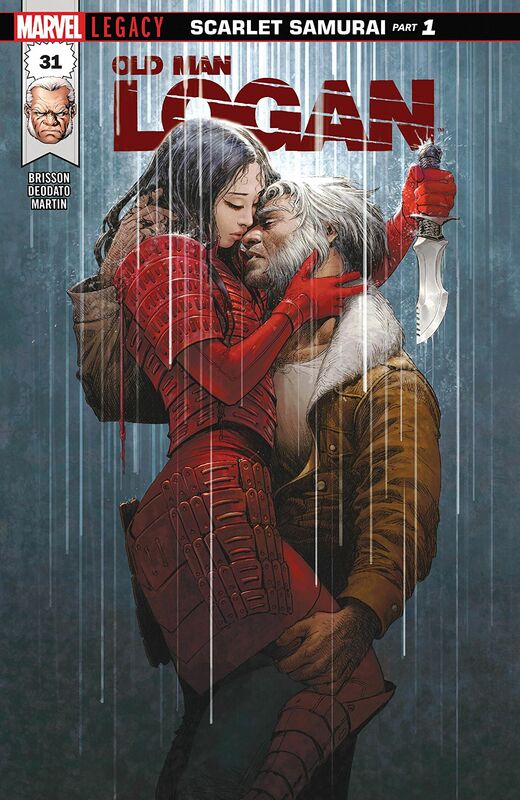 But now Muse – the Inhuman serial killer – has escaped from jail to create more murderous works of art and to stalk his former victim and one-time protégé of Daredevil, Sam Chung (AKA Blindspot). Daredevil must now do whatever it takes to stop Fisk’s plans, no matter the cost, but will he be in time to prevent all of the dark machinations unfolding around him? Daredevil’s war against Wilson Fisk reaches a thrilling, action-packed conclusion in Daredevil #600, a special oversized anniversary issue guest staring the heroes and villains of NYC, as writer Charles Soule skilfully brings together numerous interweaving plot strands for Daredevil’s epic showdown with Wilson Fisk. Daredevil #600’s impressive and eye-catching cover by Dan Mora and Romulo Fajardo JR (there’s also a wealth of excellent variant covers by David Aja, Alex Ross, Frank Miller & Dean White, and Daniel Acuna to choose from as well) offers a hint of the action that awaits you in this issue. The battle lines are quickly drawn as the heroes and villains on all sides get caught up in Daredevil’s showdown with mayor Fisk. 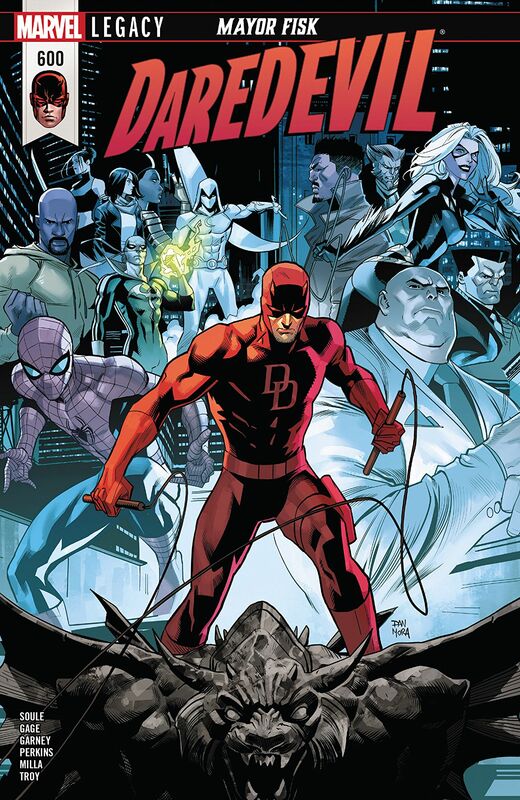 Daredevil’s plan to take down the Kingpin is even more audacious than it initially seems, with DD enrolling Spider-Man, Luke Cage, Iron Fist, Misty Knight, Jessica Jones, Moon Knight, and Echo to gate-crash a shindig between the Bronx’s super villain crime bosses – the Black Cat, Hammerhead, Diamondback, and the Owl. 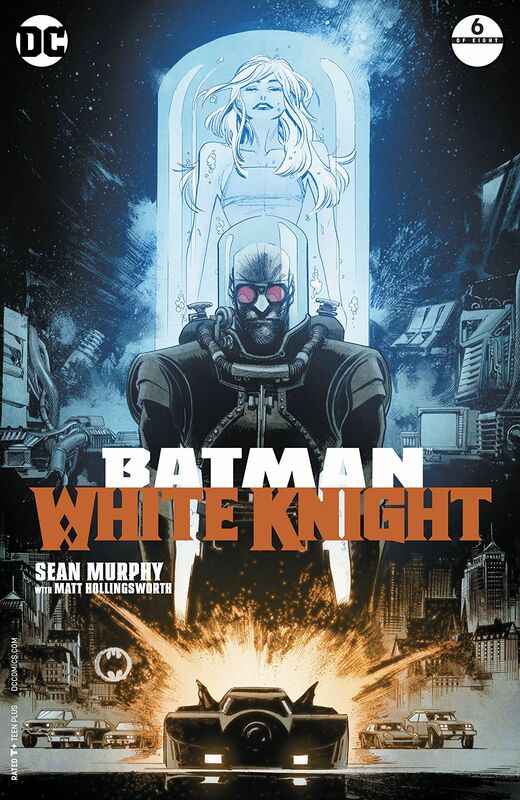 It goes without saying that the artwork by Ron Garney is as impressive as ever, with crisply refined page layouts effortlessly relaying every nuance of Soule’s script, and rich characterization adorning every page. Featuring such an extensive roll call of heroes and villains Daredevil #600 is almost bursting at the seams with characters and subplots. Ron Garney does a terrific job giving this issues plethora of characters a chance to shine, imbuing the raw power and emotion of virtually every scene with gritty intensity, striking action sequences, and with color artist Matt Milla’s subtle use of tone and shade heightening the drama to maximum effect this landmark issue of Daredevil looks absolutely stunning. Daredevil #600 certainly delivers a knockout punch as it rounds off the Mayor Fisk storyline, but even darker forces are on hand waiting in the wings, and it all builds to a shock ending that will rock Hell’s Kitchen to its core! Charles Soule, Ron Garney, and Matt Milla have crafted another superb issue of their run here, add to that the nostalgic backup story looking back at Foggy and Matt’s friendship over the years written by Christos Gage, with art by Mike Perkins and colors by Andy Troy, and Daredevil #600 becomes a milestone issue and game-changing chapter in Matt Murdock’s life that no Daredevil fan will want to miss! Old Man Logan #28 takes Logan’s mission to save the present from the apocalyptic nightmare of his own future to a whole new level, as Logan finds a new ally – Hawkeye! Teaming up again for the first time in Logan’s miss-matched lifetimes, Clint Barton joins Logan in his quest to defeat the Maestro and the Hulk gang. But as the Maestro’s grand scheme reaches its next phase, they face a race against time to prevent global Armageddon! 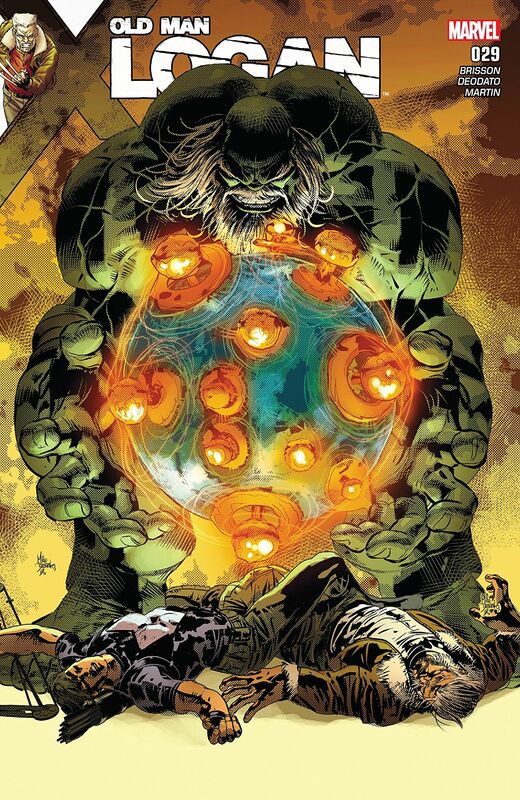 Days of Anger Part 4 seriously raises the stakes in this issue of Old Man Logan as the creative team of writer Ed Brisson, artist Mike Deodato JR, and colorist Frank Martin continue their outstanding run of this Marvel Comics series. Beginning with a sombre interlude set in the future Wastelands of Logan’s farm, the uncanny parallels forged across time continue to resonate powerfully with the present in Old Man Logan #28 as Logan prepares to fight back after his latest run-in with the Hulk Gang in Yurkon territory, Canada. 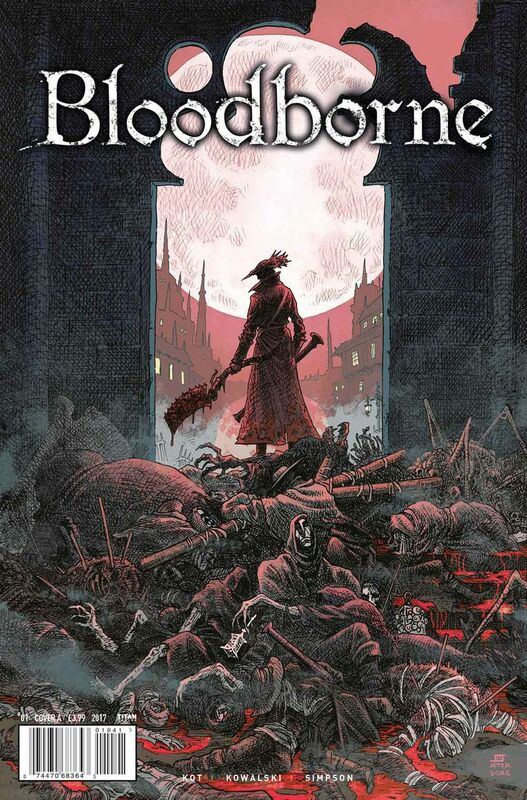 Writer Ed Brisson skilfully brings numerous plot threads together as events quickly begin to escalate. Having learned about the Maestro, the alternative universe Banner that brought the Hulk Gang to conquer this world, Logan and Hawkeye must stop at nothing to prevent the Maestro from unleashing the stolen weapons from Department H and destroying humanity. However, their friendship was forged in the future, where their road trips never end well, and Hawkeye soon learns more about the his destiny than even he bargained for! Meanwhile, the Maestro is forced to step up the schedule of his master plan, and Cambria’s role in the wider scheme of things gradually starts to emerge. 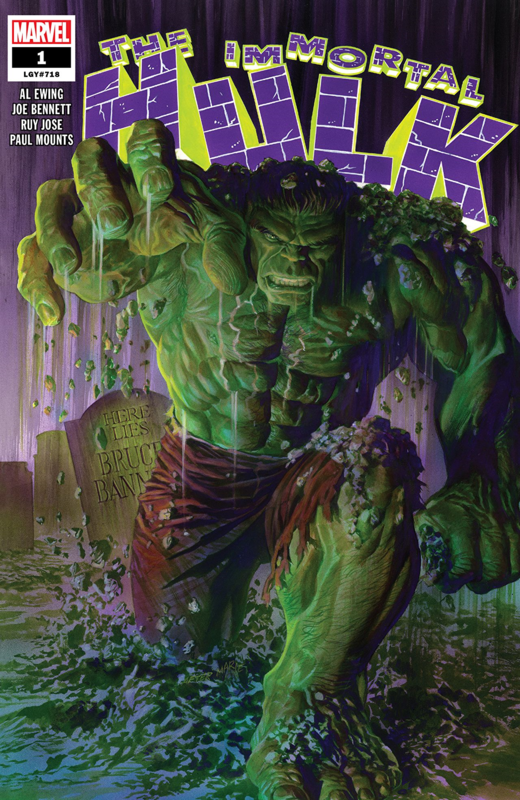 Mike Deodato’s artwork brilliantly captures the dark, brooding tone of this issue. As ever, the level of detail and boldly paced action lavished across each page is all marvellously rendered, and Deodato’s characteristic deconstructed page layouts completely immerse you in the story as numerous elements converge. The intricate palette of tones and shades color artist Frank Martin utilizes brings added gravatis to every scene. 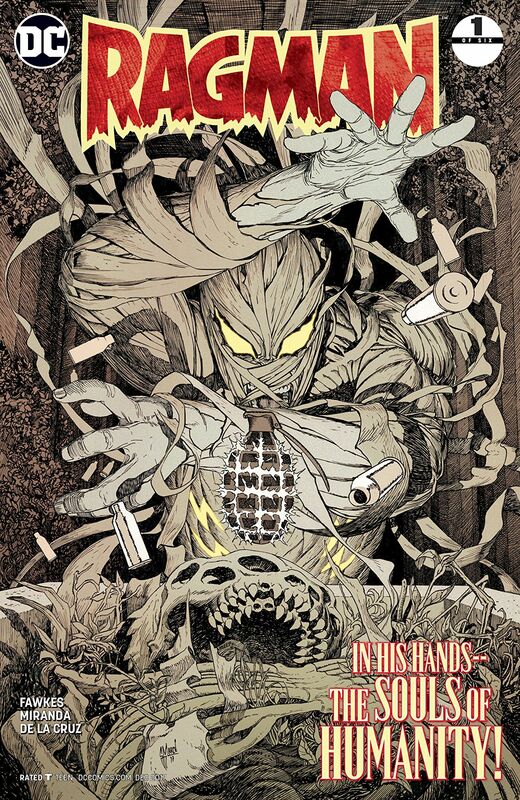 From the identity of the poacher targeting Logan’s farm in the Wastelands, to the great character moments between Logan and Hawkeye in the present, and the ruthless way the Maestro quells any challenge to his authority this issue of Old Man Logan is without doubt one of Mike Deodato’s and Frank Martin’s finest looking issues so far in this series. 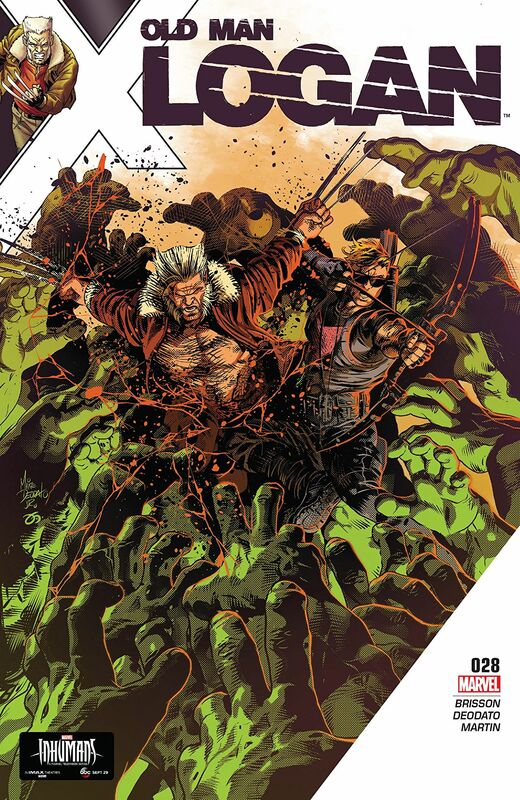 With its stunning cover by Mike Deodato and Frank Martin featuring Logan and Hawkeye in action, Old Man Logan #28 is another compelling issue packed with rich characterization, bloodthirsty action, and surprise plot developments. 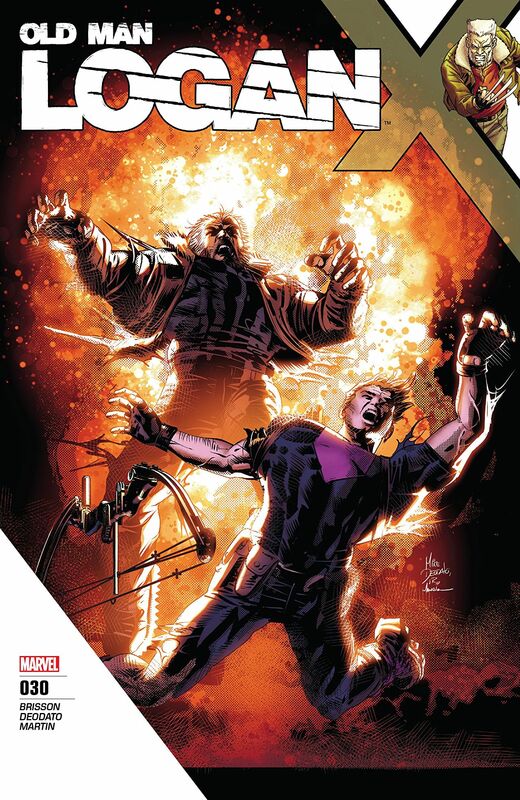 Its great to see Logan and Hawkeye working together as well, Ed Brisson scripts some brilliant scenes for them, and Mike Deodato’s artwork constantly delivers on every level. In short bub, Old Man Logan is easily one of Marvel’s best books right now, and cannot recommend it highly enough. 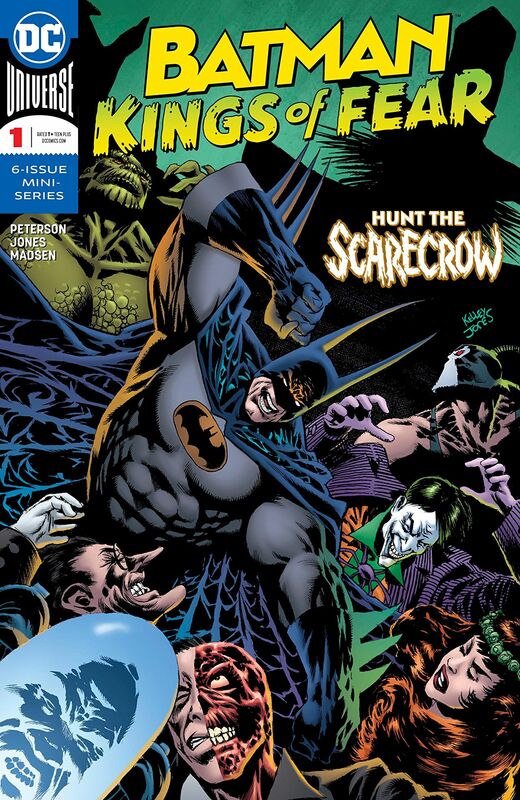 Letterer: VC’s Cory Petit / Cover: Mike Deodato JR & Frank Martin.